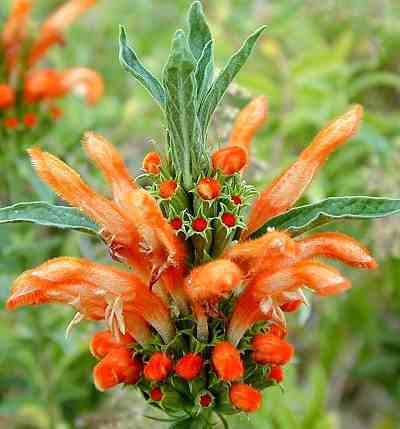 Leonotis leonurus. Lions Ear, The Staircase Plant. My great Uncle Gunter lived on a ruined fishing boat on the South Downs with his Jack Russell, Braveheart. He used to grow Leonotis Leonurus on the port side of his vessel to warn other salty sea dogs of the hilly hazard. He always maintained that this system had worked marvelously and that another vessel hadn’t come close to disaster for two decades. But even as a child I always suspected this was because the sea was fifteen miles away. What is this Leonotis Leonurus of which you speak, Higgledy man? 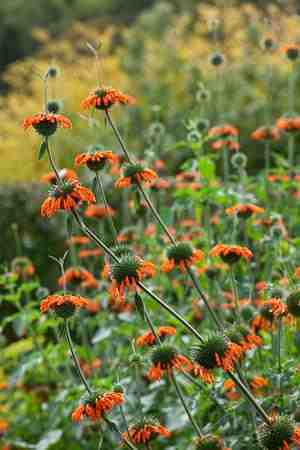 Leonotis Leonurus is one of the most full on rock and roll annuals ever known to man. Reaching to seven foot with bonkers orange flowers on vertical spires. Quite frankly it looks as though it has arrived from the future. Originating from S. Africa our friend Leonotis is a distant relative of the dead nettle and being tender need to be protected from the frosts…or treated as an annual. 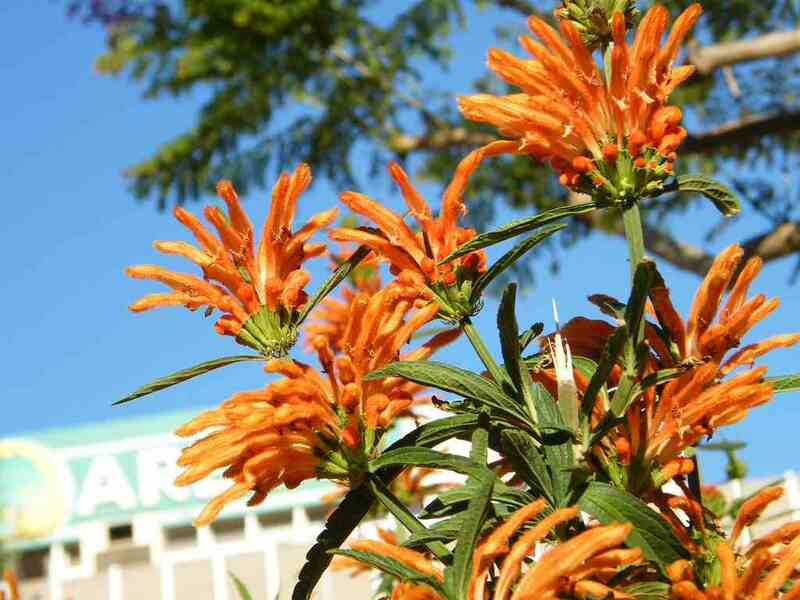 How to grow Leonotis Leonurus. Usually it is labeled as being for ‘experienced’ gardeners but don’t let that put you off. Give it a go, it’s really not that tricky. All you need to remember to do is start it off early under glass. I suggest six weeks before the last frost. So for me in Cambridge this would be the start of April. Then plant out after the last frost date. Give at least 50cms between plants. It’s best to add some compost to your soil before planting. They are drought tolerant but don’t let it get too dry whilst it’s still a youngster. This fella is a winner as far as attracting wildlife is concerned. Although obviously it is best at doing this at home in its native South Africa. However our own insects dig the vibe it offers and bees and butterflies seem to love being in it’s company. As a cut flower it goes well with bluecornflowers…perhaps a little Ammi Visnaga to soften it up…and Cosmos seems to work well too. Leonotis will appear in the Higgledy Shop in a few short weeks…probably before Halloween. Verbena bonariensis	Digitalis purpurea. Foxglove. Hi Robert…I am trying to find some myself…I will let you know…I suspect i will have them in the shop for next spring…so stay tuned! Ben, this issue of poisonous cut flowers has been on my mind lately. There are so many that shouldn’t be ingested (delphinium, foxglove, lupin, etc. etc.) – how does one handle this issue? Obviously bouquets wouldn’t sell very well with big “toxic” signs attached. Do you, as a grower, feel any responsibility, especially when you’re selling direct, not through a florist? (This paranoid interrogation is coming from someone who allows self-seeded foxglove to grow amongst the raspberry patch where little children snack on fruit – well-trained little ones though!) Just wondering if there’s anything to watch out for when selling poisonous blooms (other than not eating them yourself). I’m not worried..and am certainly not sending ‘toxic’ labels…I have never heard of anyone becoming ill from a bunch of flowers. There’s enough to be worried about in the world without being afraid of flowers! Just inform kids they are NEVER to eat anything from the garden or the wild without properly identifying it. Glad you like it Karen, you have such good taste for the finer flowers in life. :) I’m surprised it isn’t grown more. Really? Psychoactive? Don’t let that rumour get around these parts – my entire crop will go up in smoke. In little ol’ NZ it’s a perennial – I love it, it gets all feisty and ferocious just coming into autumn. When everything else is getting a bit dark and dreary. Very regal, a fitting flower for your court my liege. Thank you Princess Anna, We have had it in the Royal court for some time and look forward to it’s re-arrival next Spring. It has been used in South African herbal remedies for ions…very powerful stuff I’m told. Also VERY toxic in high does…#organdamage So keep those Kiwi teens in the dark.